I’ve never attempted night photography or astronomical photography, until last night. A while back on Black Friday I bought an app that I’d had my eye on for a while. Its Photopills, a very cool tool to assist in planning all kinds of shots involving the sun, moon, milky way and meteor showers. I’d highly recommend this very sophisticated app. There is a bit of a learning curve, but there are lots of video tutorials, manuals, blog posts etc. to get you started. So, last night was the height of the Geminids meteor shower and I thought this would be a great opportunity to try to capture my 1st night shot. There is a lot to learn and think about to get good shots and a lot of post processing to get the spectacular images like this. After last night, I’ve got a lot to learn and practice. Let the adventure begin! 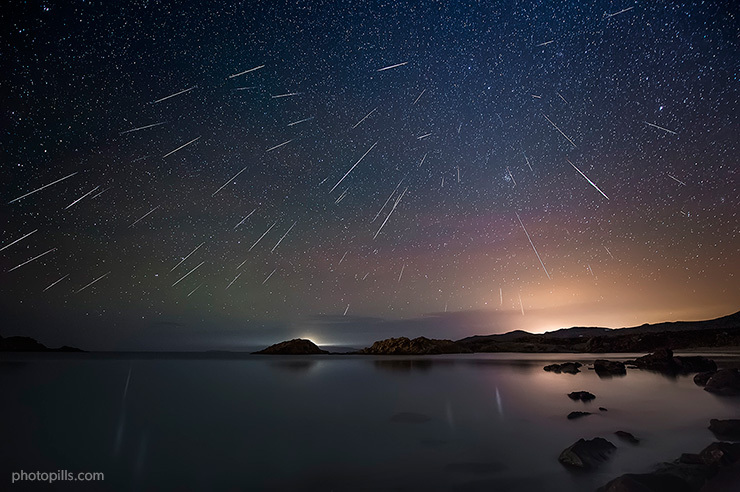 The peak of the meteor shower was to be between 2am and 4am. This is a little late for me so we head out to Birds Hill park around 1am and hope for the best. Turns out it’s not near dark enough and there is still some significant light pollution from Winnipeg and the town of Birds Hill etc., lesson learned – research a darker location. Thankfully, its warm for this time of year at -1C and only a light breeze, which at 1am seems plenty cold. I set up the tripod, cable release and the manual exposure settings and get ready to shoot. Using the Photopills app and its Night Augmented Reality (AR) capability I figure out which way to look and point the camera. Almost immediately we see a couple of meteors or “shooting starts”, very cool. It seems that the approach is to shoot frequent exposures, each one being 25 sec. and hope that a meteor happens during that timeframe and the camera is pointing the right way. I have the lens set at 10mm (16.1mm effective on my crop sensor camera) so it’s covering a pretty big chunk of the sky. However I’m likely not pointing the camera in quite the optimum direction. I’ve left the Photopills app set for a slightly different date & time, so the Night AR view is not quite right, but it’s sort of close. Lesson #2 learned, check you app settings. After taking about 30 photos and not too sure if any of them have captured a meteor I’m getting cold and we pack it in. After looking at all the photos two have meteors, one is very faint and the other is nice and bright! Success! And here is it after a little quick Lightroom magic. My first meteor capture, can you find it? So, not only was there a lot of light pollution the white snow cover and the scattered clouds in the sky didn’t help either. Still, not too bad for the 1st effort. Just in case you can’t find the meteor or want a little info on what part of the sky you’re looking at here is some help. I’ve connected the dots for the Big Dipper and an arrow to the meteor.